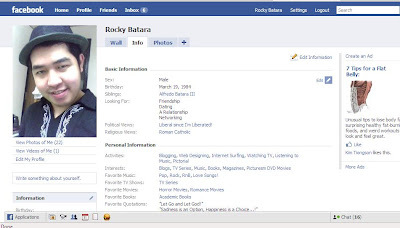 Home active blog sites blogs Cafe World Facebook Farmville Fishville Friendster Hi5 internet hobby Multiply online personal rocky social social networking site socially incline websites Catch Me On The Web! Yeah, I am a socially active person! I love to socialize with the different people of different types and race! I am socially active specially on the web! Yup, I am always online! You can always reach me around the net! 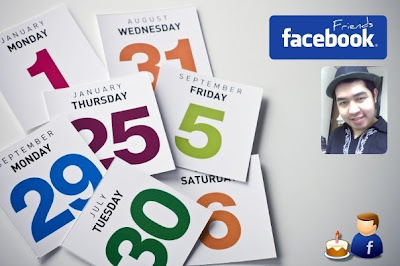 Which of these social networking sites you're always active? Well, we're the same if you're answer is Facebook! Yup nowadays, I am a certified Facebook addict! Besides adding more and more friends, I really love to play its games like Farmville, Fishville, and my favorite Cafe World! 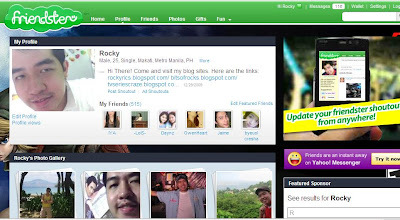 Friendster is my former well-loved social networking site. Since college I am more active on this. I have an account there since 2004. But when the Facebook become so popular in the early part of 2009, my Friendster inclination slowly fading down! But still my account here is active! You can still be friends with me here in Friendster. But, don't get shock when you see a thinner version of me here since majority of my pictures there were from my College days and from my first job! My last update here was on April 2009! Next to Friendster is Multiply. 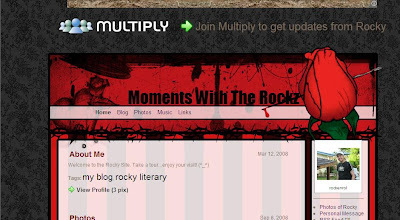 I started to create my account here in May 2008. Since Friendster was blocked in our company and I had no way to upload my pictures or update my profiles, I started to like multiply! But then, I didn't anymore upload my pictures there. Pictures that were there was my second job memoirs and our 2008 Company outing as well as my other personal photos! Yup, it is still active and you can still add me as your contact there! I only update it with my new posts and links! The least of the four was the Hi5! My account there started in 2004 way back in my College days. 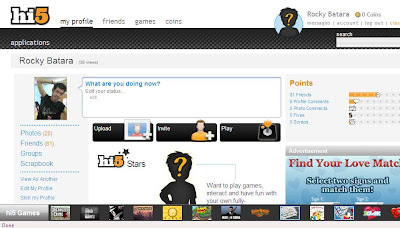 Since Friendster was blocked in our school, I created an account in Hi5. I wasn't anymore update it though it is active. What you can see more here were my College pictures. Purely college photos...a thin rocky boy! But, you can still add me here as your friend! Now did you see how my four social networking sites differ from one another even though they were all intended for networking friends? Yeah from these sites, you will see the beautiful evolution of me!